This Facebook marketing tip relates to the official pages marketing tool in Facebook. For clarification on where this tip fits into the greater Facebook marketing picture, please view our post Facebook Foundations: Facebook's Marketing Tools Explained. The image you select to represent you on your Facebook page is an important visual representation of your branding. Yet, often overlooked is that there is 200 x 600 pixels of design space that you can use to market yourself or your business. Why upload a simple photo or logo when, with some thought and creativity, you can really utilize that space to promote your business? In order to create a custom profile image, you will need image editing software such as Photoshop, Photoshop Elements or Illustrator. Or, you can ask a graphic designer to create one for you. This should not be an expensive project. Direct them to create a 72 dpi image in a .jpg or .png format that is a maximum size of 200x600 pixels. Note that the maximum file size for an page image is 4MB. Also consider changing out your profile image on a regular basis. It is very easy to do. 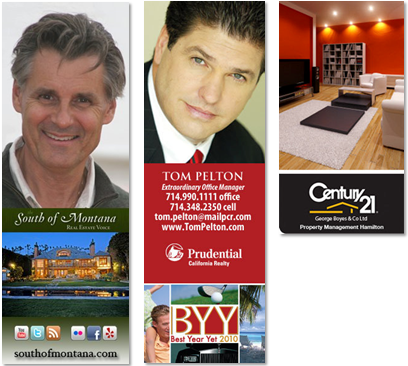 Do you have a new listing you want to promote? Maybe you want to feature a community of the week. Or, maybe you want to congratulate your latest closed transaction on their new home. Why not put that in your page image. It keeps the look of the page fresh and gives fans something new to see when they are on your page. It’s a simple idea that doesn’t have to be expensive and can be very effective in reinforcing your brand and your business objectives. Note you can also maximize the profile image on your personal profile. The maximum size for profile images is 180 x 540 pixels for the new profile layout. Also note that it appears someday the official page layout will be modified to look more like the new profile layout which means the page image specs will also likely change to 180x540.